Some of my best friends have recently approached me declaring their sadness beyond reason for the death of their “favorite actor,” Paul Walker. Comments like “he was such a fantastic actor,” “Fast and Furious will never be the same,” and “he was hands down my favorite actor” dominated my newsfeeds. But before his death, I’ve never heard such things. Beyond his role as Brian O’Connor in the Fast and Furious franchise, what is Walker actually known for ? Don’t get me wrong. There are select films of his that I’ve absolutely enjoyed. For example, his role in “The Lazarus Project” was fantastic. The film itself is extremely underrated. But has his character as a person and performance as an actor really made an exponential impact on American society that his death would be so greatly and widely mourned? A quick overview of films he’s played in since 2000 – besides the “Fast and Furious” franchise – reveals ratings of 6.5 or lower on a scale of 1-10 for every one of his films (with the exception of “Running Scared,” 7.4; “Eight Below,” 7.2; and “Flags of Our Fathers,” 7.1). “Vehicle 19,” a film released early 2013, received an exceptionally low rating of 4.8. The “Fast and Furious” films itself averages out to be 6.6, which is a rather mediocre score (source). These aren’t ratings I’ve come up with on my own. The people have spoken. However, this isn’t a stab at his acting career. I simply believe that many of us have overemphasized the death of a celebrity. And quite an average celebrity at that. Yes, that is an opinion, and I am entitled to it. But I’m not heartless. I will acknowledge the fact that a death is a death, and under no circumstances should it be taken lightly. Paul Walker was someone’s child. Someone’s best friend. Someone’s lover. But my concern is for the sudden, irrational praise of Walker’s life – which seems to be more than that of a hero. Allow me to introduce you to a mighty band of heroes: the veterans of World War II. Heroes, yet the truth is that the memory of their outstanding prestige is diminishing. Guess how many American WWII veterans die every day? Go on, make a guess. Just over 600 a day. Of these, about 22 veterans commit suicide every day due to the post-traumatic stress disorder they’ve suffered. And it’s not only veterans of World War II; an entire arsenal of veterans from various American wars can be added to this equation. Every day, real life heroes are dying. The backbone of America is disappearing, unnoticed to the larger public eye. Yet, these fine men and women alike served and died not for the glorification of themselves but for the freedom and betterment of America. Should not these heroes and heroines be the ones emphasized and praised in American culture on a daily basis? Should not their lives be the ones dominating our news feeds, our hashtags, our pins? Should not parades be held in their honor, celebrating their life? Instead, the lives of the popularized are celebrated. America’s societal focus is tremendously misdirected. This continuous glamorization of Paul Walker’s death reveals how priorities in what we idolize have gone askew. I use the veterans of WWII to exemplify an ideal that should matter to us, but the greater truth is this: there are far more valuable ideals that should keep our minds occupied than the death of an overly-popularized figure. Unfortunately, I am the voice of the minority. This post will never appear on the first page of Google searches when the death of Paul Walker is looked up. However, I still hope to redirect the attention of those who care where it matters. On a final note of closure: thank you, Paul Walker, for the entertainment. Your career has been enjoyed by many. Your life will be dearly missed by family, loved ones, and fans. But thank you, U.S. army, navy, marines, air force, coast guard, national guard, veterans, and all the men, women, fathers, mothers, brothers, sisters, and children of God alike who serve and have served our nation. 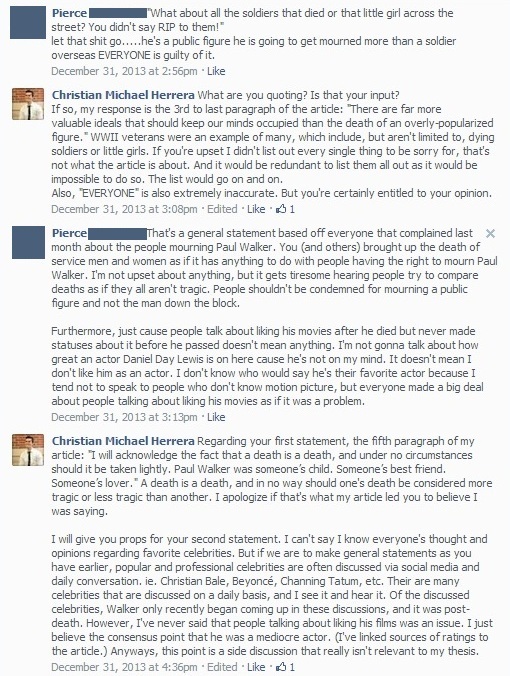 Note: The following is a screenshot of a discussion I had on my Facebook page with a reader concerning this article. I feel that it adds to my post as well as resolves any confusion some readers might have. Previous PostOral Surgery Glitches the MatrixNext PostWas the Super Bowl XLVIII Rigged?